LATEST NEWS: The 5th Annual Speaking Of Stange UFO EXPERIENCE ANNOUNCED! This year we have upgraded the event to include DAYTIME and NIGHTTIME competitions. In the afternoon, we will launch the daytime craft, and the rest after sunset. The purpose of this is to make the most realistic looking UFO you can. There are only two rules: 1) It has to be safe and 2) It has to fly on its own. Most people use helium balloons to lift their creation into the air. However, during the daytime competition, you must not be able to see the balloons from the ground (or they must be camouflaged as part of the UFO). You must supply your own building materials, helium, and balloons. Judging is based on what portions are visible in the night sky, creating the illusion of a real UFO. Nothing is too small and simple, nothing is too large and complex. Note: you can purchase small helium tanks and balloons in the party section of most stores like K-Mart, Toys-R-Us, or Party City, usually less than $30. Light sticks and lightweight LEDs are popular construction materials, along with glow in the dark paint. If you don't want to make one, just come to enjoy the free light show! You can also make use of a grill which will be made available, so bring your own food and beverages to enjoy a cook-out setting. Donations are appreciated. Take highway 19/23 north from Asheville, approximately 10 miles to the Jupiter-Barnardsville Exit (Highway 197 north). Turn right towards Barnardsville and travel 5.9 miles to the Post Office. Turn right onto Dillingham Road. Shortly, you'll see the Community Center and ball field on the left. 2007 3rd Annual UFO Experience, was better than ever! Once again, the skies of Western North Carolina were ablaze with man-made UFOs. Over the years, we've seen them powered by helium, fire, rocket force and rotors. The 2007 event displayed a great variety of techniques. For the third year in a row, First Place went to Jeff Wilson (see http://jeffsfireworks.com/) for his amazing triangular-craft. 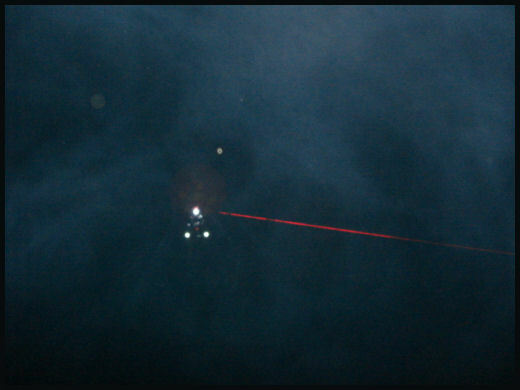 It scanned the ground with on-board lasers, emphasized by a smoke screen on the ground. He was also able to transform his creation into a different kind of triangular craft with the switch of a button and send it right back into the air. Warren stated, "If I saw that over my house, I'd swear I'd seen a space craft of some sort." Jeff won two free nights at Graystone Cabins in Barnardsville (see http://www.graystone-cabins.com/), plus gift certificates to the Barnardsville Grocery and Classie Moon Thrift Boutique, home of Warren's Free Paranormal Exhibit (see http://www.classiemoon.com/), and a model UFO that actually flies. Second Place went to Jim Robinson. It was his first time at the event, and he blew everyone's mind by creating a hot-air balloon-type craft with a series of pyrotechnic stages. 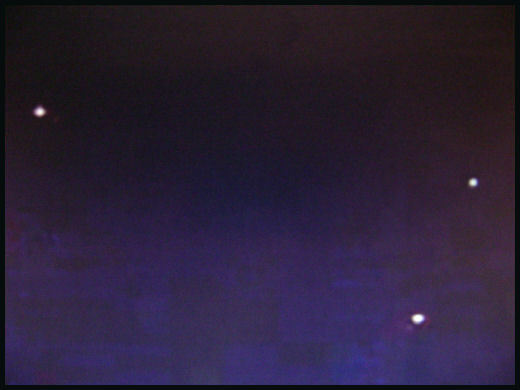 Once airborne, we watched the craft appear to change shapes and colors, spewing forth a variety of lights end effects. After approx. 10 minutes, it self-destructed, vaporizing safely in the night sky. Jim won two nights at Graystone cabins at half-price, and two free tickets to the Haunted Asheville Ghost Tour (see: http://www.hauntedasheville.com/). Third place went to Asheville's visionary artist Yeva (see http://www.yevasuniverse.com/). It was an enormous honor to have her participation since Yeva has the largest collection of alien curiosities in the world--clearly an expert on what looks compelling in the sky! This was the first time she built a craft for the event. She impressed the judges, since her craft utilized a system of lighting that pulsed with unusual energy and colors. The pattern appeared truly mysterious in the sky, making for a believable UFO. Yeva won a ticket to the Haunted Asheville Ghost Tour and a discounted ticket to Dark 30 Asheville on Sept. 29, 2007 (see http://www.dark30tour.com/). We thank all the participants and congratulate everyone on a fun night with friends. The perfect weather gave us perfect flights. In fact, some craft, like the hot air balloons, moved in an uncharacteristically smooth and "seemingly-controlled" way by the even currents. In fact, on a couple occasions, the balloons, at the whim of nature, even changed course, coming back in the opposite direction due to "box winds" higher in the atmosphere, sending them away and then right back to the point of origin. An inexperienced observer could certainly interpret this as intelligent control beyond the whim of nature. The event was taped by URTV, and should air soon on local cable in the Asheville, North Carolina area. But below are some pics, links to pics, and links to video footage online. We hope you'll join us summer of 2008, as there are already plans in store to boggle some minds. One competitor may even try to create the massive Phoenix Lights effect, to full scale!!! Thank you to everyone who made this event another success! 2008 4th Annual UFO Experience. A New Champion! The Fourth Annual UFO Experience Was Historic. Second Place went to Jeff Wilson, the 3-year First Place Winner since the events inception, in 2005. Wilson is also the first UFO champion to go on Coast to Coast AM, briefly interviewed along with Joshua P. Warren on August 19, 2008. Jeff's initial plans went awry when there were unexpected problems with his main entry, so he had to compete by entering a secondary craft, far less elaborate than his original. Jeff's unexpected problem was echoed by the new champion, Jim, since Jim's grand finale, a huge balloon with multiple-stage effects, also had to be cancelled at the last minute due to a frame break that could not be easily repaired. This is a great example of the significant technical challenges these talented engineers face, and illustrates the difficulty in faking some of the extreme UFO sightings reported throughout history. Third Place went to a newcomer, Crystal from Asheville. Her unique design incorporated a folded, translucent mesh to disperse multi-colored (especially violet) LEDs below. Honorable Mentions went to Phil Preston from Asheville (who made his craft from the plastic, fast food container for his lunch earlier in the day), Forrest Connor and his friend Andrew (who installed a small jet engine to help guide their cone-shaped model) and Asheville's cosmic artist Yeva (whose impressive, blue-tipped star-like craft was barely saved from a tree). All original site content Copyright 2002- by Shadowbox Enterprises, LLC. The quality and customer service I received were 5 stars, and I really love the bomber jacket girls leather jacket USA. These are luxurious jackets at a quite affordable cost. Web site designed by Paranormal-Investigation.com.